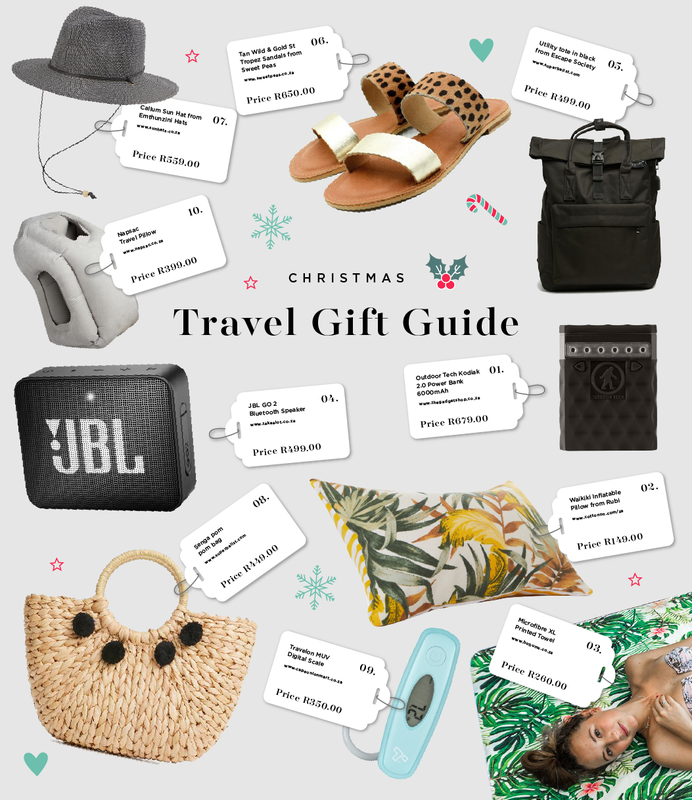 We’ve round up our perfect travel gift guide for Christmas this year. It’s a few of our favourite finds, which makes the perfect gifts to give this summer. The rugged, waterproof Kodiak 2.0 Power Bank puts serious charging power and 100 lumens of bright light in your jacket, pocket, or bag. Twin outlets for dual-device charging and enough juice (6,000 mAh) to charge a tablet or any other small-to-medium-size device. Off the grid, off the map, or just out to lunch with no outlet nearby, the Kodiak 2.0 Power Bank has you covered with its rugged, portable design, dual power outlets, and 6000 mAh of charge capacity. That’s enough juice to charge a tablet, or enough for you and your partner to maintain sanity all the way from South Africa to London on a flight. Pack your bags and take the Waikiki Inflatable Pillow on your next flight, road trip or your next trip down to the beach. Relax in style or add it to your bedroom set for extra decoration. This compact, lightweight and easy to carry microfiber towel will make the perfect beach or pool accessory this summer. You can pick from a range of designs, or even print your own! With its high absorption properties, it is very effective in drying the body. It will have you dry in no time! Travelling has never been easier – especially with this utility tote bag. It’s designed from heavy-duty canvas that’s easy to clean and water resistant. It also features a built-in USB port, a side pocket, adjustable shoulder straps as well as a padded laptop sleeve. Handmade by artisans in South Africa from 100% Natural cow leather. Sweet Pea’s Collection is a South African lifestyle brand. As an independent boutique label, that is passionate about designing and handcrafting beautiful & comfortable bespoke ladies footwear, they only use the best locally sourced genuine leather products. Each pair of Sweet Peas is custom made to order especially. This folded ribbon hat with waxed cord trim crown and chinstrap is a winner on the back of any 4X4 outdoor vehicle. Suitable for both men and women it will have you covered from the hot African sun. Rock the beach on your next holiday with this stylish pom pom bag. Perfect to store all your beach essentials or for a quick outing to the local grocer. Don’t let unwanted airline fees ruin your holiday mood. Save your hard-earned cash by weighing your luggage with this small, light luggage scale. It’s very easy to use: it has a rubberized grip, a coated hook (which hooks easily onto the handle of your bags), and an easy-to-read digital display. It uses a 1CR2032 lithium battery, which is included, and it can weigh luggage of up to 50kg. It can display the weight in either pounds or kilograms, just hold down the power to switch between the two options. *The prices of these items were correct at the time of publishing. Subject to change.